This is the outfit that I wore for running around town (but with flat shoes instead). The sweater is a combination of my two favorite things -- stripes and open knit! 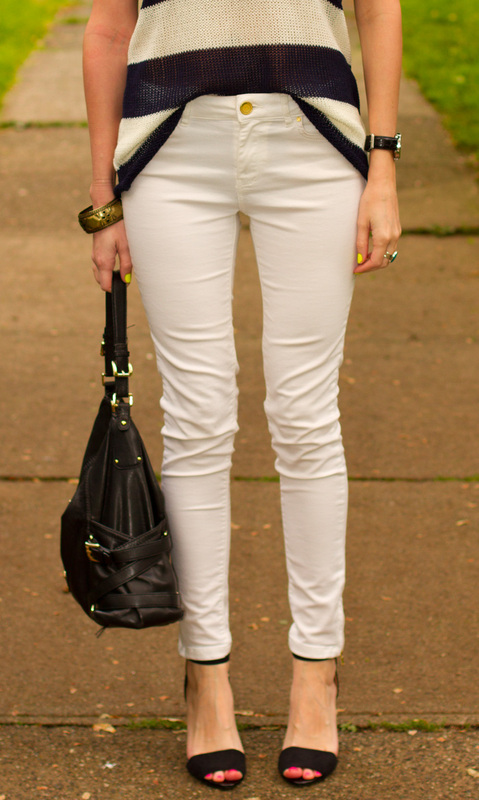 Oh, and loose, so I guess that's my 3 favorite things :) The white jeans are also my favorite right now and I love how they really brighten up an outfit and make it appropriate for spring. I hope you're having a great week! Thank you so much for stopping by my blog -- I hope you like it! you look way too fantastic! I love the blue and white striped knit and those shoes look amazing on you. The yellow nails are super cute too! open knit, stripes, loose...that sounds perfect. i have been on the hunt for the perfect summer sweater like this one! you look beautiful! Love your blog! Hope you will visit mine too! Let me know if you want to follow each other! Love the top. Been looking for one similar myself. What is the color on your nails? I can never find a decent, bright yellow. Its beautiful! Amo todo tu outfit , está genial. Un beso , Te Sigo ! I seriously need to find some white jeans! The only pair that I have ever liked, have been my maternity jeans. Sort of not appropriate now that my baby is 7 1/2 months now! Ha ha! Awesome outfit, dear! You look beautiful! Love this look on you!!! Loving those heels!!!!!!!!!! i love delicate knits--you look amazing!! Thank you so much for all of your lovely comments and support!